FLEDGED project is moving ahead! During this second phase of the project experimental activities have intensified to demonstrate the technologies in an industrially relevant environment. Preliminary calculations of efficiency and economics of a reference FLEDGED plant have been carried out, highlighting the areas of improvements. In the meantime, simulation tools for the SEG and SEDMES processes are being refined. Risk and sustainability analysis are ongoing and the first results are expected in the next phase. In the 200 kWth dual fluidized bed facility at USTUTT, tests of the sorption enhanced gasification (SEG) of wood pellets have continued. Experiments were conducted at different gasification temperatures and different steam-to-carbon ratios. It was possible to modify the M-module in a range between 12 and 1, showing the flexibility of the process. Also the target value for DME production (M=2) has been reached. Some of the results from these tests are presented in the diagrams below. The experimental experience showed that the process can be operated stably in the pilot scale facility at gasification temperatures between 600 °C and 774 °C. Syngas composition and M-module strongly depend on gasification temperature due to the influence on the equilibrium carbonation reaction, which influences the amount of CO2 removed from the syngas. In addition to the experiments with wood pellets, the first experiments with biogenic waste material from the Ecohispanica plant have been successfully conducted. 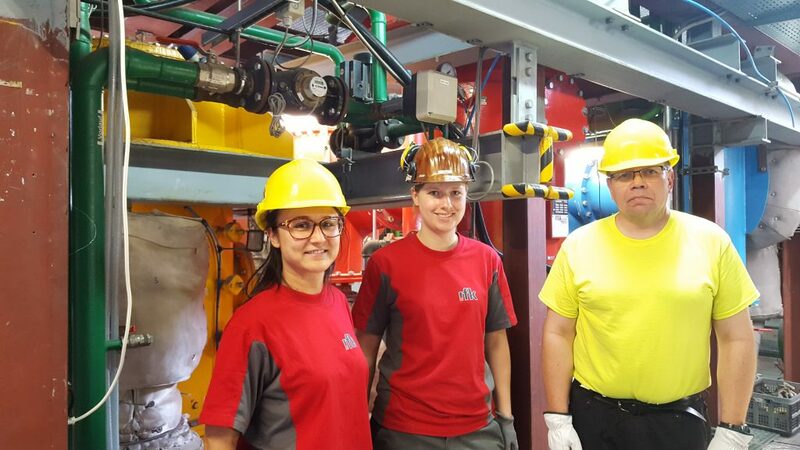 During the last campaign the team of the University of Stuttgart led by Selina Hafner (center) was supported by Isabel Martínez (CSIC, left) and Juha Palonen (Sumitomo SHI FW, right). The abovementioned results have been presented at FBC23 (International Conference on Fluidized Bed Conversion, May 13-17, 2018, Seoul, Korea). The presentation is available for download in the dedicated section of the website. Continued SEDMES testing at lab-scale test facilities, the so-called “Spider” and “CaTe” facilities, has led to progress in terms of the further delay of steam breakthrough. The time for SEDMES operation, i.e. the period of high concentration of DME, is extended by the reduction of the applied space velocity as well as the fine tuning of operating conditions, specifically the regeneration conditions (pressure, temperature). Also different catalyst formulations (commercial samples) have been tested. Corroboration of the results with different catalyst formulations shows the applicability of the different catalysts for the SEDMES process. Preparations for SEDMES scale-up are in full swing. In these next experiments a single column reactor, the so-called “SEWGS-1” facility, containing about 2 kg of sorbent and catalytic material will be used for testing the SEDMES process. 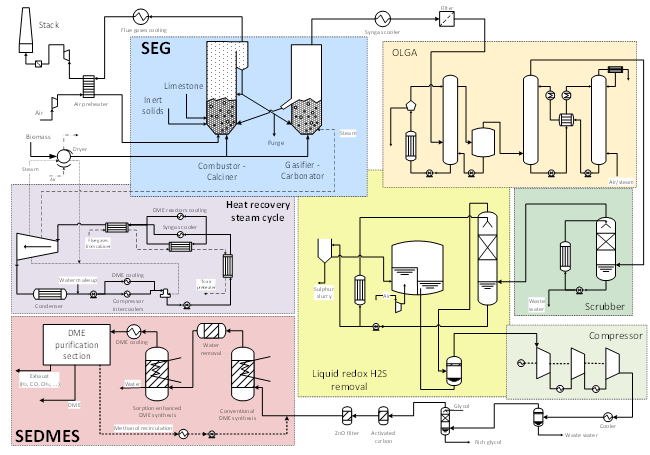 Besides validation under industrially relevant conditions, these tests give further input for reactor and process modelling, and are a first guidance for the full cycle validation (“SEWGS-7”) planned in a later stage of the project. The parametric analysis of the conventional reactor for direct DME synthesis has been extended considering different catalysts configurations in order to study the effects of intraparticle diffusion phenomena on the process. Meanwhile, a dynamic heterogeneous model of a single tube of the SEDMES converter has been developed. The model, similarly to the one developed for the conventional reactor, consists of i-species mass, energy and momentum balances written in 2D cylindrical coordinates for the gas phase, coupled with i-species mass and energy balances for the catalyst phase and for the adsorbent phase. The model has been used to get some preliminary results and now it should be assessed and validated on experimental data. The CSIC Institute of Catalysis and Petrochemistry, developed two series of catalysts: one series for the methanol synthesis from bio-syngas and one for DME synthesis from methanol dehydration. The of this work was to find the optimal reaction conditions to obtain the direct synthesis of DME from bio-syngas by performing the reactions with a physical mixture of the two series of catalysts. The physicochemical properties of the synthesized materials were thoroughly analyzed. A series of Cu/ZnO/Al2O3 catalysts with different Cu loading was studied, including the commercial Cu/ZnO/Al2O3 catalyst for methanol production. The effect of the reaction pressure, temperature, contact time and bio-syngas composition was analyzed, as well as the use of promoters: Pd, Zr and Ga. 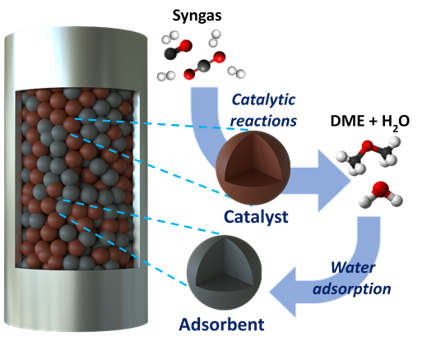 Here we show the results of the experimental matrix developed to study the reaction conditions using the commercial catalyst. The experimental results for synthesis, characterization, and catalytic performance of supported HPA, HZSM5 and g-Al2O3 catalysts for methanol dehydration are presented. Heteropolyacids are very active for methanol dehydration reaction. When supported onto inorganic solids they show very high methanol conversion to DME at temperatures as low as 140 ºC with 100% selectivity to DME under undesired hydrocarbon by-products. HZSM5 and g-Al2O3 are used as acid benchmark catalysts to compare the methanol dehydration performance with supported HPA catalysts. Studied catalysts for DME production reaction from methanol at different conditions. LHSV=1.11 h-1. POLIMI developed an Aspen Plus model to calculate the heat and mass balances of a reference complete FLEDGED plant, including: i) a biomass drying and preparation unit, ii) the SEG process, iii) the syngas cleaning units for the removal of tar (OLGA), soluble contaminants (water scrubber), bulk sulfur removal (liquid redox process) and residual contaminants and H2S (activated carbons and ZnO bed), iv) syngas compression, v) DME reactors and vi) DME separation unit. The model allowed calculating the key performance indicators such as the biomass-to-DME conversion efficiency and the electric efficiency. 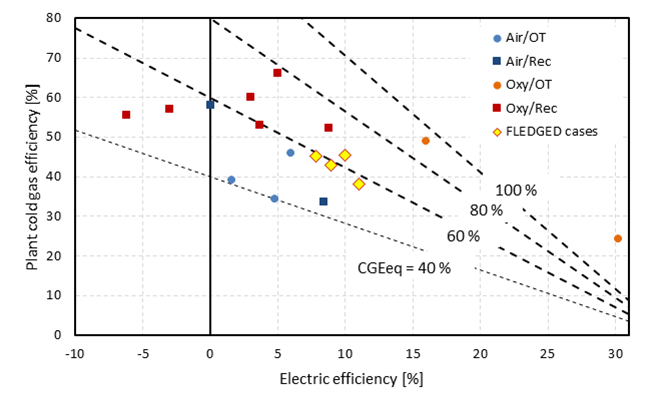 The calculated overall “equivalent” cold gas efficiency CGEeq (i.e. taking the primary energy credits/debits associated to the electric balance) is in line with those reported in the literature for other biomass to DME processes based on air-blown gasification systems. An economic analysis of a plant with 100 MWLHV of biomass input was also performed. With a biomass unit cost of 125 €/t, the calculated DME cost ranges between 46 and 55 €/GJ, largely associated to the cost of biomass (57%) and to the investment cost (40%). This preliminary techno-economic analysis allowed identifying the critical plant units and the governing process parameters. Lessons learned will be used in the second half of the project to explore solutions capable to increase the economic competitiveness of the process. The preliminary techno-economic study with a detailed description of the model and of the results obtained is available as public deliverable on the project website. Increased public awareness of industrial safety issues and regulatory demands as response to accidents has led to the integration of risk assessment studies at the early stages of innovative process design and development. Risk assessment carried out in the FLEDGED project aims at eliminating or minimizing identified hazards from the process rather than incorporating add-on controls and safety barriers at a later stage. 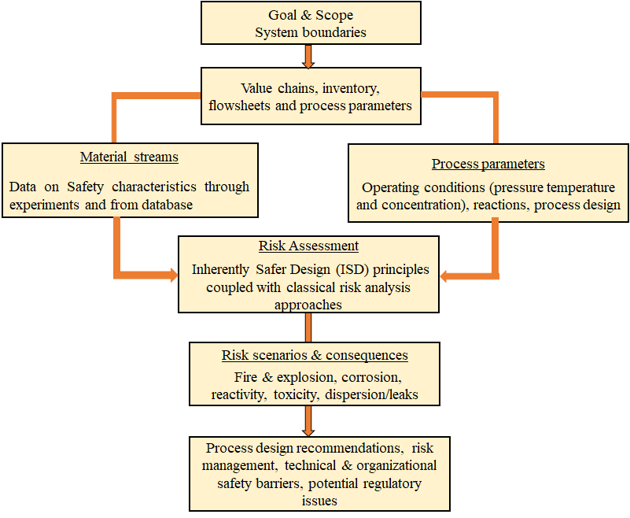 A stepwise methodology is implemented to study the risks related to process steps and materials all along the value chain, making use of Inherently safer Design (ISD) approach for the safe and sustainable development and deployment of the FLEDGED technology. One of the tasks in progress is the safety characterization of the material streams for the physico-chemical properties related to hazards (e.g flammability, explosibility) and related risks (fire, explosion sensitivity, self-heating…). Dedicated experiments will focus on the wood biomass, refuse derived fuels and catalysts. The risk assessment will focus on comparison of process configurations with respect to safety (e.g. hydrogen integration and storage, reforming and CCS options), identification of accident scenarios, evaluation of ATEX zones, choice of equipment, safe handling and storage of biomass and proposition of technical and organizational safety barriers. The results will contribute to the safe development and deployment of the FLEDGED technologies. Results achieved has been presented at national and international events and conferences in the last months. POLIMI and TNO part of ECN represented the project at the DME Sustainable Workshop, presenting the FLEDGED process for flexible and intensified DME synthesis. Preliminary results of experimental campaign on SEG and modelling of gasification in the dual fluidized bed process have been presented by University of Stuttgart and Lappeenranta University at FBC23. ECN and POLIMI presented at ISCRE 25 the preliminary experimental campaign on SEDMES regeneration strategies and reactors modelling activities. Thermodynamics of CO/CO2 conversion to liquid fuels and different options for Sorption Enhanced DME Synthesis have been presented at the 16th International Conference on Carbon Dioxide Utilization. CSIC, POLIMI, USTUTT and QUANTIS presented a joint work on the performance comparison of FLEDGED process and CH4 production from biomass with CO2 capture at the 14th International Conference on Greenhouse Gas Control Technologies (GHGT-14). The preliminary results of the FLEDGED process have been also presented at 12th ECCRIA, GIC 2018, 8th International DME Conference, 13th SDEWES and CHEM REACTOR 23 conferences. FLEDGED project participated also in the meetings on “Bioenergy, Advanced Biofuels and Renewable Fuels”, “Biofuels and Alternative fuels” and “CCS, CCU and alternative fuels”, organized by EU commission (INEA). Coordinators of ongoing projects on similar topics met to find synergies and maximize the impact of the research.